වයස අවුරුදු 15 න් පහළ පැවිදිව සිටින භික්ෂු මහා සංඝරත්නයට අධ්‍යාපන, නඩත්තු ආධාර පිරිනැමීම. මේ වයස් සීමාවෙන් පහළ භික්ෂූන් වහන්සේලා වැඩසිටින විහාරස්ථානවලට විවෘත ආරාධනයයි. 2015 මැයි 3 වැනිදා සවස 3.00 ට ගංගාරාමය, 61, ශ්‍රී ජිනරතන පාර, කොළඹ 2 ස්ථානයට වැඩමවන්න. වෙසක් පොහෝ දිනය නිසා යම් භාරකාරයෙකු සමඟ පිරිස එවිය හැකිය. වෙන වෙනම නම, ගම, ලිපිනය, වයස, ආචාර්ය ගරු ස්වාමීන් වහන්සේගේ නම, ලිපිනය ලියාගෙන වැඩමවන්න. භික්ෂූ නඩත්තුව භාරගත් දායක දායිකාවන්ටද ඒ අවස්ථාවට පැමිණීමට ආරාධනා. මාසිකව මෙම භික්ෂු නඩත්තුවට ආධාර දිය හැකි අය ඉදිරිපත් වන්න. තම ශක්ති ප්‍රමාණයෙන් එය ඉටු කළ හැකිය. Providing educational and subsistence assistance to all Buddhist Monks under age 15. This is an invitation to all temples and monasteries where monks under age 15 reside. 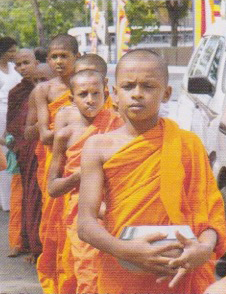 Please come to Gangaramaya Monastery, 61, Sri Jinarathana Road, Colombo 02, at 3.00 p.m. on the 3rd of May 2015 (Vesak Full Moon Poya Day). Please send them with a guardian. Each monk should have a document indicating his name, address, age, and the name and address of his Revd. Teacher. We invite those who are capable of providing financial assistance on a monthly basis for the subsistence of these young monks. You could provide this sacred assistance, in terms of your capacity and according to what you could donate.